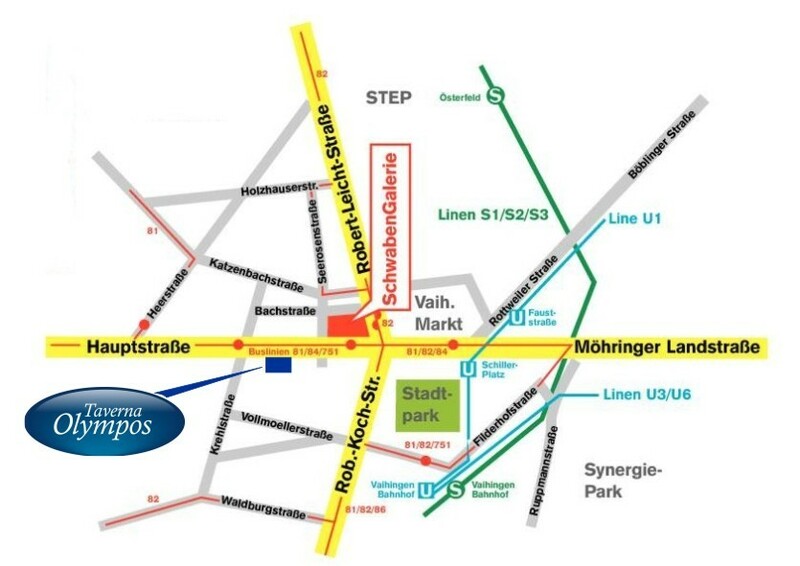 Our Taverna Olympos is located on the Hauptstrasse near the area of the shopping mall SchwabenGalerie in Stuttgart's second largest district, Vaihingen. The close location to many international companies and research institutions (Daimler training facility, BMW branch Stuttgart, Telekom, Lapp Kabel, US EUCOM, 2km; Bauknecht Hausgeräte GmbH, 1km; AXA insurance, 1,2 km) as well as the American Patch Barracks and Kelley Barracks and the central location to the inner city, the new Landesmesse, the airport, the musical halls and the brilliant connections make this 4-star design hotel to the optimal basis that it is for all activities in and around the state capital Stuttgart. Further details can be taken from the map and the directions. With our route planner, you can create exact directions. Simply state your starting address. That way, you can find us easily and without any complications. Feiertage von 17:00 bis 22:00 geöffnet. Kein Ruhetag.